Although I think of myself as a defensive value investor I’ve never really defined “defensiveness” in terms of the sector that a company operates in. Usually I just look for companies that have a history of profitable growth and dividend payments stretching back at least a decade. If a company has been consistently successful over such a long period of time then in most cases that’s defensive enough for me (assuming of course that it makes it through the rest of my investment checklist). However, I’m always looking for ways to reduce risk without obviously reducing returns and I think paying more attention to defensive sectors is one way to do it. As you can see there is no mention of which sectors the portfolio should invest in or stay away from. Although I’m reasonably happy with those risk reducing rules of thumb, as well as the fact that the portfolio is full of consistent dividend payers, I would like to have a way of measuring how defensive or cyclical the overall portfolio is. I can then use that information to make sure that, at a high level, the portfolio is weighed towards companies that can maintain and even grow their revenues, profits and dividends through the next recession. My starting point for this is to review the official FTSE Sectors and note whether they are defined as defensive or cyclical by Capita’s excellent quarterly Dividend Monitor (which you can find here, although you might have to search for it). There are various ways to find out which sector a company falls under. Many investment information websites show each company’s FTSE Sector and Sub-sector, but be careful because some, such as Morningstar, use their own system. I tend to use the London Stock Exchange and Investegate sites as they’re both free, have search capabilities and RNS data (although I prefer Investegate as an investment research tool as it has 10 years or more of annual RNS information, making it easy to find annual reports going back a long way). 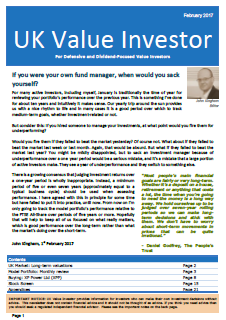 It doesn’t take long to build up a table of a portfolio’s holdings and whether each one is in a defensive sector or a cyclical sector. The question now is: How defensive do you want your portfolio to be? If you’re obsessed with defensive stocks then of course you could limit yourself to only investing in defensive sectors. That’s an entirely legitimate approach, but it’s not the approach that I’m going to take. Because I’m already restricting the portfolio to successful companies that have paid a dividend in every one of the last 10 years, I feel that even my investments in cyclical industries are relatively defensive. The model portfolio already holds companies from many cyclical sectors such as Mining, Banks and Oil & Gas Producers, but I don’t see the specific companies in question as being especially cyclical. The portfolio should be at least 50% invested in defensive sectors (I’ll consider any cash in the portfolio to be a defensive investment as well). Currently the model portfolio owns shares in 29 companies (29 instead of 30 because I sold one earlier this month and will replace it next month), 14 from cyclical sectors and 15 from defensive sectors. So it seems that by blink luck, and probably the fact that I’m mostly looking for steady dividend growers, the portfolio is already quite defensive. The current weightings are 47% in cyclical shares, 45% in defensive shares and 8% in cash, which gives a combined defensive weighting of 53%. Going forward I’ll re-check that weighting each month to make sure that any buying and selling of shares doesn’t cause the portfolio to drift away from its defensive core. I’ll be the first to admit that the FTSE Sector categorisations above aren’t perfect, nor could they ever be. 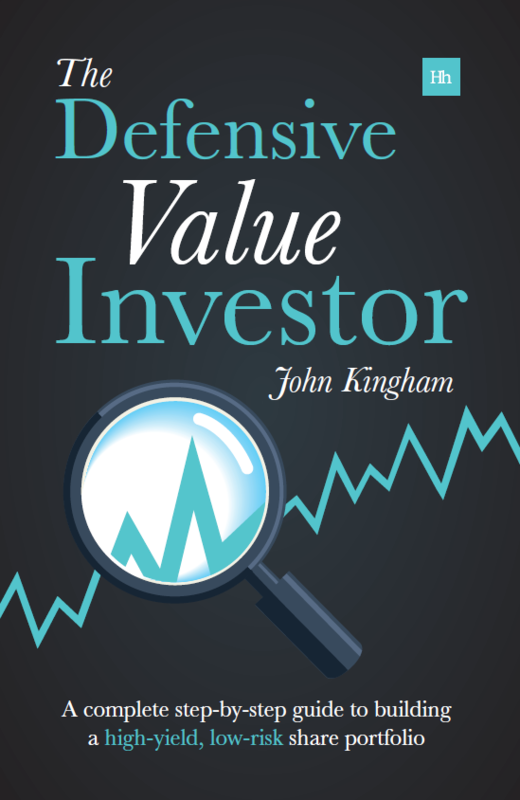 Calling a sector defensive does not mean that every company in it is defensive, and even if a company is correctly defined as defensive it does not automatically follow that it will behave in a defensive manner in an economic downturn. However, I do think those defensive sectors hold considerably more defensive companies than the cyclical sectors, and that defensive companies are much more likely to maintain sales, profits and dividend payments in a downturn than cyclical companies. And so for that reason I think using sector definitions is simple and practical way to understand and control the approximate defensive/cyclical nature of a portfolio. Note: If you want to drill down to a finer level of detail (which I don’t because I don’t think it would necessarily add much value) then you could look at Sub-sectors rather than Sectors, using for example the defensive/cyclical definitions from the FTSE Cyclical and Defensive Index Series (PDF – see page 8). Some good news today from Tesco which rebased their dividend which was a normal decision given the circumstances. Bought a few shares in the morning, so I am now 5% invested in supermarkets: 3% in Morrisons and 2% in Tesco. Hopefully it will pay one day, although I expect the share prices to get lower in the short term and I would add some shares. In my opinion Morrisons should be taken private sooner or later to make better use of the land and property, keeping less shops and only the profitable ones. Tesco could be a turn around story, however it needs to show that it cares about its shareholders and it focuses on creating value for them. I’ve changed this defensive/cyclical rule slightly to exclude cash from the calculation, which will have the effect of making the portfolio even more defensive-focused. So using the example above, with cyclical stocks at 47%, defensive stocks at 45% and cash at 8% I said the portfolio was 53% defensive, and so that was enough defensive stocks under the 50% minimum rule. However, excluding cash cyclical stocks make up 51% of the stocks in the portfolio, with defensive stocks making up the other 49%. So on that measure I need to add at least one more defensive stock to make the stock selection more defensive. I have really enjoyed following your blog which I find quite similar to the Stephen Bland HYP strategy I follow. Thanks very much. Just noticed that in the article above you have General Retailers as Defensive, which I thought surprising. Having checked the latest Dividend Report Monitor I see that it is classified as Cyclical. Just thought you should know. Thanks. Hi John, thanks for pointing that out. The dreaded typo/brain freeze strikes again. I’ve probably copied the same mistake into 20 different places on the site so I’ll have a look around and try to fix them all.